"NASA 1975 font" for the word, "DALLAS" -w/slight change: actually "completing" the second "A". "FUTURA" Stanley Kubrick's fav font for the word, "TECHNOLOGY". -but with words and graphics representing: Business, Technology, Consulting, People. -a blue-colored STAR graphic representing the city, "Dallas, Texas". 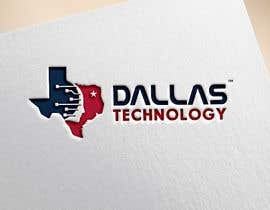 -The Logo should have the words "Dallas Technology" *AND* a TRADEMARK symbol for "Dallas Technology"
-The Logo should have a graphic part that exudes, Business, Corporate, Information Technology, IT, Computers, Networks, Consulting, Security, Secure, Computing, Internet. -The business concept is: "Dallas Technology" consulting business located in Dallas, Texas, USA. #1387 #1388 #1389 #1390, Please Check, Thanks. please check #1335 and i am waiting your feedback, feel free to ask any question i will be happy to answer it.....thank you. #1005 please check and review! Hello contest Holder Please check my all work and please give feedback and click on chat button Regards Syed ! Please check my entry #825 #827 .hope you will like this & give feedback soon. #930 #938 please check it.